It was a night of grace, class and elegance of the Filipina Beauty Queen. I've never been into pageants that much but have really high regards to the people who live an breathe it. We are all proud of our contestants and made sure they've got the backing of a nation when voting online, campaigns are concerned. We've now gotten Filipino designers to actually do the gowns too and pretty much did all the things we hoped would change our fate in the Miss Universe competition, and it did bear fruit. After 40+ years of waiting for it, we finally have Pia Alonzo Wurtzbach as our new Ms. Universe 2015, at the most opportune time and slightly controversial one at that. We were a little sad she didn't get to do a proper Ms. Universe walk so when her homecoming was prepared, they arranged a part of the program to be her official walk. Here's some excerpts, a collection of 3 videos as part of our coverage of Pia's Homecoming a few days ago. Thanks to the goodness of SMART Communications, PLDT Home for having us! Erik Santos and Yeng Constantino opened the show. Xian Lim hosted it together with Dianne Castillejo and Venus Raj. A parade of former beauty queens who won the Bb. Pilipinas - Universe title also happened that evening. This is Part 2, the reveal of Pia whilst she was serenaded by Piolo Pascual and her crush Sam Milby. This is part 3 where Pia Alonzo Wurtzbach did her official walk as Ms. Universe 2015. 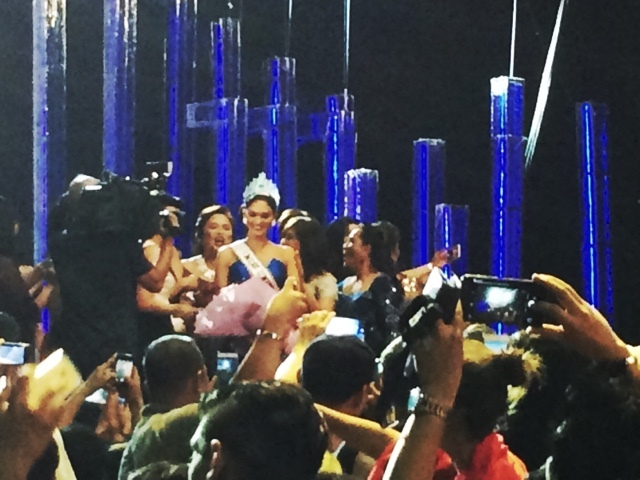 She wore the Blue Gown that Albert Andrada made for her during the actual pageant. She was stunning! Again, thanks to the lovely people at Smart Communications and PLDT Home for having us!